Home » WEST PALM BEACH-BASED GREEN DWELLINGS, LLC. 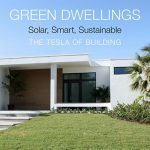 INTRODUCES FIRST CERTIFIABLE LEED PLATINUM MODULAR HOME IN SOUTHEAST U.S.
WEST PALM BEACH, Fla. (November 10, 2016) – Green Dwellings, LLC announces the installation of the first certifiable LEED Platinum modular, solar, sustainable model home in Southeast U.S. The 2,500 sq.-ft. home at 201 Santa Lucia Dr. is the magnificent result of years of design and engineering led by Green Dwellings founder and CEO, Karen Adams. The home is hurricane rated exposure D (Wind Velocity 175), and is of modular construction, built to 90 percent completion in a manufacturing facility in central Florida, and then installed on site in one day. The mid-century modern designed three-bedroom, two-bath model includes solar electric panels on the roof, a solar hot water heater with a 80 gallon capacity, a whole-home “Smart System” capable of controlling all functions from any mobile device, an efficient AC system, formaldehyde-free cabinets for clean indoor air, Energy Star appliances, dual flush toilets, LED lighting, and is made of sustainable, recycled or renewable toxin-free materials and finishings. Sales price of the 2,500-sq.ft. model is $675,000. This is the first of several models being offered. Other environmentally friendly options include a rain-water collection system routed into the landscape irrigation. 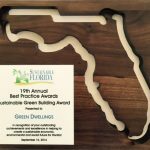 Last month, Sustainable Florida awarded Green Dwellings the statewide honor of “Best Practice” in the Green Building Division at the annual Best Practice Awards presented in Fort Lauderdale. The Sustainable Florida Best Practice Award is the premier state-level recognition for accomplishments and leadership in sustainable development. For nearly 20 years, the award has been the high benchmark of best performance standards in the integration of environmental, social and economic factors for the long-term sustainability of Florida. Karen Adams is a lifelong environmentalist, and her background in real estate, the arts and the historic preservation of homes in the Northeast fuse beautifully in her new role as CEO of Green Dwellings. She anticipates that her market will be concentrated in the Gulf States, the Florida Keys and the Caribbean Islands, as the modular-style design allows for easy transport by either tractor-trailer or cargo ship. In just the short period since the model was completed, Adams has already received interest not only from individuals and families, but also from developers who have the ability to create an entire community of sustainable, hurricane-resistant housing. Additional information is available at www.greendwellings.net or 561-582-4041.